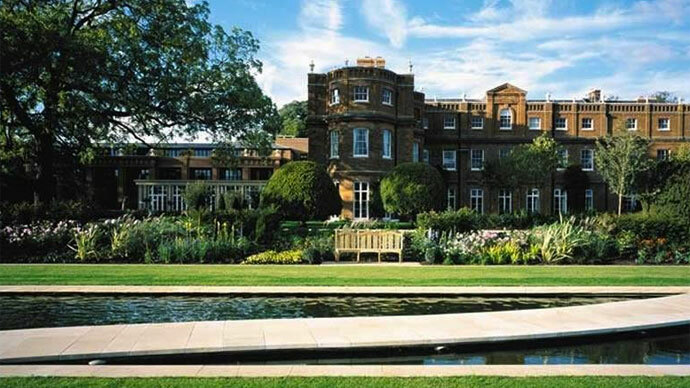 138 members of the global elite are meeting in Watford, England for the 61st Bilderberg Conference, with protesters from around the globe flocking the town to say ‘no’ to the rich and wealthy 'deciding the planet’s fate over coffee'. Amazing day at #Bilderberg 2013! Nearly 4k people! Around 2k capacity inside the festival and around 2k more outside who couldn't get in! 19:17 GMT: Labor MP and former minister Michael Meacher has demanded that Prime Minister David Cameron make a statement to the House of Commons next week regarding his participation in the Bilderberg talks. Meacher said he would ask the Speaker of the Commons, John Bercow, to grant an “urgent question” in Parliament next week, a move which would force the Prime Minister to answer the deputies’ questions regarding the talks. “This is western capitalism at its highest level. We are entitled to know,” Meacher told the Telegraph. "Where there is a congress like this, which clearly has a very important purpose, it is because something very valuable is happening in terms of their attitude, plans, proposals for the future of our economies. We, the rest of us, are going to be affected,” Meacher insisted. "When David Cameron goes to Brussels for a very important meeting of heads of government of the 27 [EU member] states, he gives a statement to the House of Commons and subjects himself to cross-examination from MPs,” he continued. “If we can do that on an issue which we already largely know about, why not on this much more important occasion?" 19:10 GMT: David Icke, the controversial writer and speaker who believes that a secret cabal of reptilian humanoids called the Babylonian Brotherhood rules over humanity, addresses thousands of demonstrators at Bilderberg protest. 12:22 GMT: David Cameron will attend the Bilderberg conference on Friday night to take part in a discussion on “domestic and global economic issues,” the British Prime Minister’s spokesperson said. Some of the protestors at #Bilderberg think #Obama might have flown in last night. Also #PMs expected to attend. Still trying to confirm. 22:12 GMT: Interestingly, serving UK prime ministers had historically not been invited to Bilderberg meetings. Though according to a survey by MSN UK, Margaret Thatcher, Tony Blair and Gordon Brown all attended Bilderberg conferences prior to each becoming prime minister. By contrast, the current chancellor of the exchequer, George Osborne, has attended four Bilderberg conferences, in addition to this year’s. 21:05 GMT: Labour MP Michael Meacher told Sky News that the meeting lacks transparency, which directly conflicts with Prime Minister David Cameron’s recent pledge to his constituents for just that following a series of scandals in his government. “David Cameron said he was going to set up laws for proper regulation of lobbyists, and for transparency. If there is any conference which required transparency, which required democratic accountability it is the Bilderberg conference, because this is really where the top brass of Western finance capitalism meet in order to make their deals, listen to each other, lobby - including government ministers, particularly George Osborne and Kenneth Clark, and as far as I know there will be no statement in the House following it saying what happened, and how it might affect government policy. This is totally in contradiction to the government’s commitment to have greater transparency,” says Meacher. 20:14 GMT: Jon Ronson, the author, documentary filmmaker and author who once tried to infiltrate a Bilderberg meeting in Portugal, spoke with Sky News on this year's meeting in Watford. “Obviously there’s some mythologizing around Bilderberg, because for decades they were very secretive. For a little while they pretended they didn’t exist. But they do exist, and they’re not telling us what they’re doing in there,” says Ronson. “They always meet one time a year, at a five-star hotel with golfing facilities. And yeah, they’re really powerful people. It seems to be run by business, the idea is big business people. So this year it’s Jeff Bezos, Eric Schmidt, and over the years it’s been Heinz and Smithkline Beecham. They invite up-and-coming politicians along, with the idea that they can offer the up-and-coming politicians wise words. This is what ‘Bilderbergers’ have told me. And they’re globalists, and they feel like they want to try and spot the next presidents or prime minister,” he adds. 19:04 GMT: Local residents in the town of Watford are forced to change their daily routine due to security measures at the conference. 18:59 GMT: The lounge in the 5-star Grove hotel where the Bilderberg meeting is taking place. The hotel itself is seen behind the trees in the left of the picture. 18:25 GMT: People in Bilderberg protest zone find creative ways to show off their dissatisfaction with the actions of the global elite. 18:14 GMT: Max Keiser's co-host, Stacy Herbert, has tweets that they have arrived in Watford. 17:20 GMT: Every protester, who arrives at the Bilderberg protest zone, undergoes a pat-down by the employees of the G4S company, which provides security for the Conference. 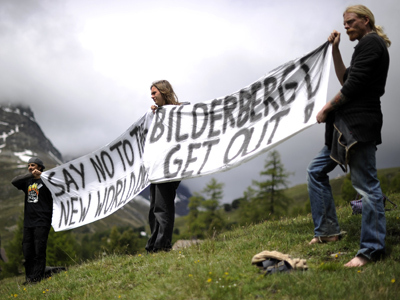 16:02 GMT: Traditionally, thousands of protesters from around the world are flocking to the site of the Bilderberg Conference to say ‘no’ to the rich and wealthy shaping the planet's future. 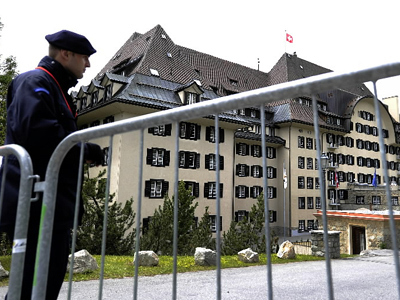 Security has been tightened around the town, with a no-fly zone enacted over the Bilderberg meeting and concrete and wire barriers surrounding the 300-acre premises of the Grove hotel. 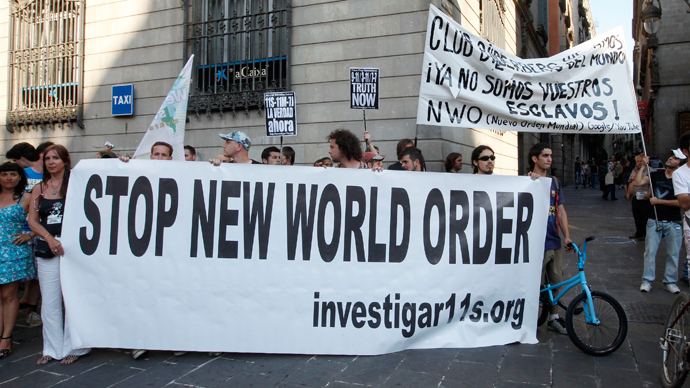 15:51 GMT: The Bilderberg Group, long criticized for a lack of transparency, has this time revealed some of the main topics of the upcoming meeting, with cyber warfare, US foreign policy, “developments in the Middle East” and “Africa’s challenges” expected to be on the agenda. 15:40 GMT: RT starts live updates from the 61st Bilderberg meeting, which is taking place at the 5-star Grove hotel in the English city of Watford on June 8-9. The 138 members of the global elite – politicians, bank bosses, billionaires, chief executives and European royalty – get together annually to discuss the most pressing issues in global politics and economics.